CRUNCH, CRUNCH, CRUNCH, CRUNCH, CRUNCH, pause for water, CRUNCH, CRUNCH, CRUNCH, CRUNCH, CRUNCH. 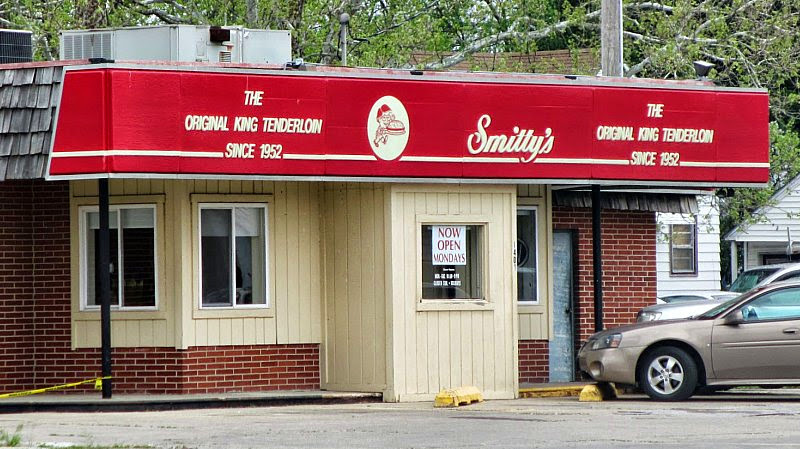 This is the sound of eating the King Tenderloin at Smitty's in Des Moines. 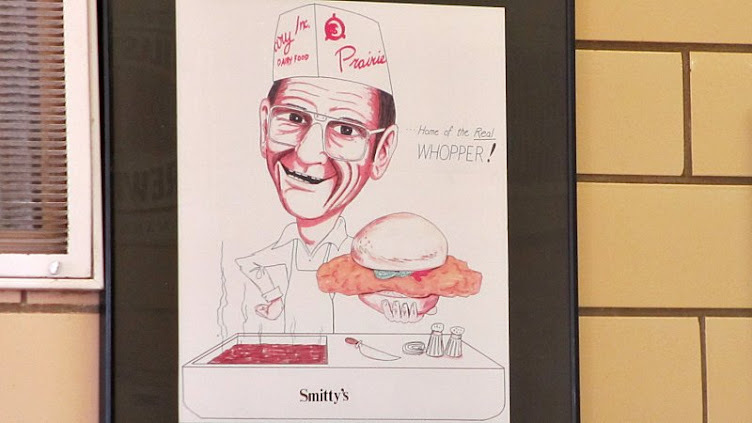 Smitty's has been featured in Grourmet Magazine, early editions of the Roadfood Book, and KCCI's Cruising for Comfort Food segment. 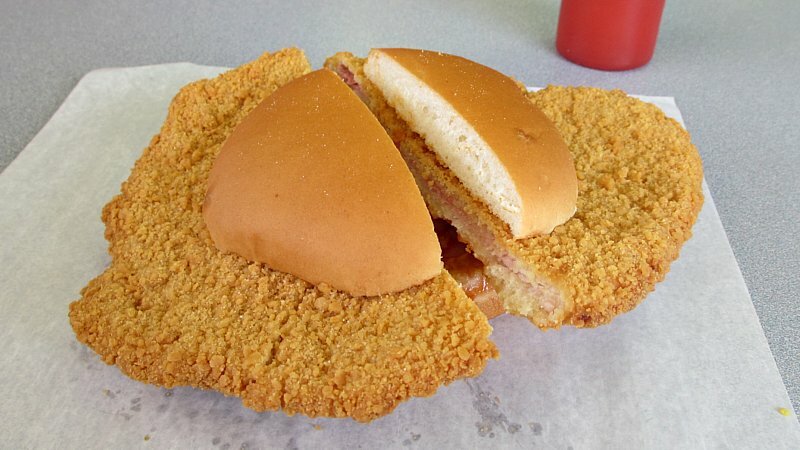 The periodic national exposure means Smitty's is the first place people think of when getting a breaded pork tenderloin in Des Moines. Location: 1401 Army Post Road on the South Side of Des Moines. Directions: Its a few blocks from the Airport. The old location was taken out when the runway was expanded years ago. 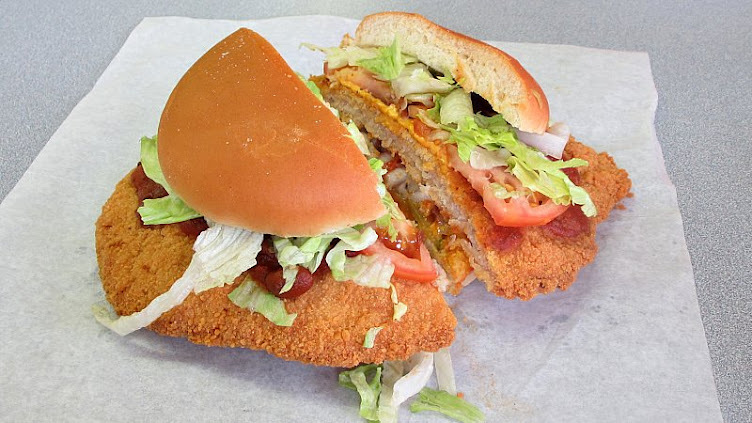 The Original King Tenderloin: The first thing that gets people here is the size. This is a true half pound or more of tenderized pork loin. 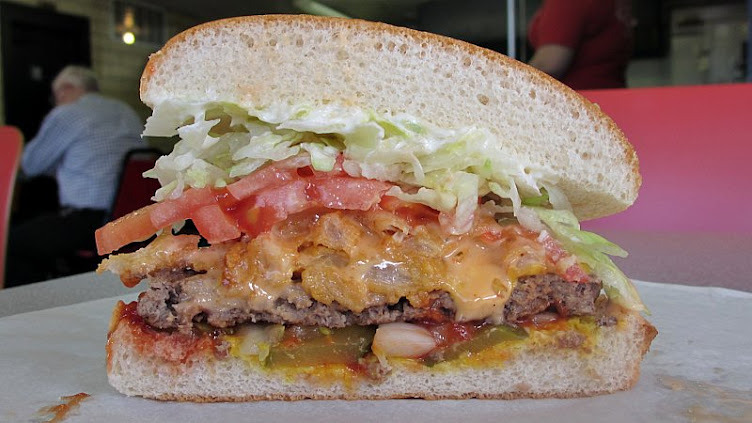 It gets pounded out into an extra wide shape that makes the sandwich seem even larger. 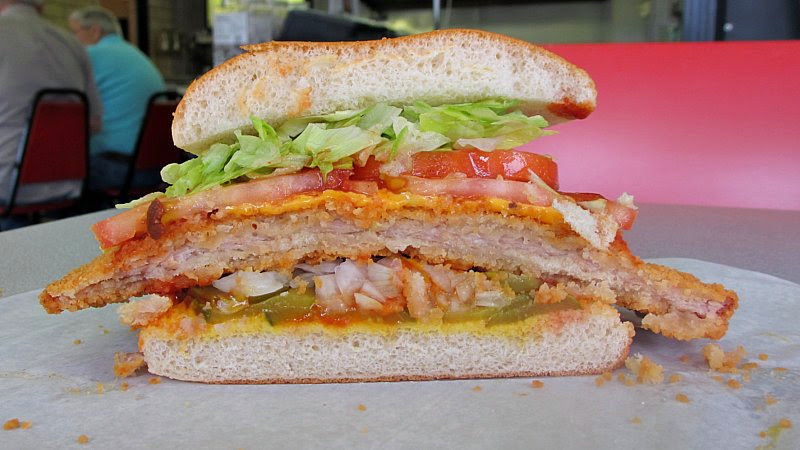 The breading is a thick layer on either side that has a texture of cracker crumbs on top of cracker crumbs. Biting releases a shattering sensation that sends crumbs spreading in every direction. The thing about the breading is that it is all crunch, little seasoning if any to be tasted beyond a sprinkling of salt after cooking. The King Tenderloin is more about subtle flavor of the pork loin and cracker breading than anything else. I think I saw the fryer set to 325° and the large size of the loin makes for considerable cooking time. The pork meat inside is more steamy and hot than juicy, but very hot when it arrives in front of you. 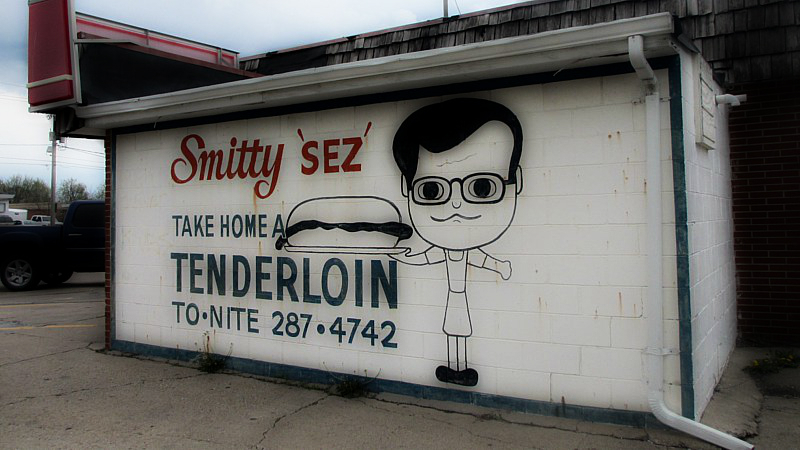 It gets pointed out that Smitty's cooks their tenderloins from the freezer, but a lot of places do this. Tenderloins are made earlier and pulled out to fry when a customer orders one. Judging by the archive newspaper articles on the wall, this has been done for some time. In theory they could run out of tenderloins late in the day with no means of making more. In practice there is a giant freezer with a gigantic stack of King Tenderloins and even more in the storage area. 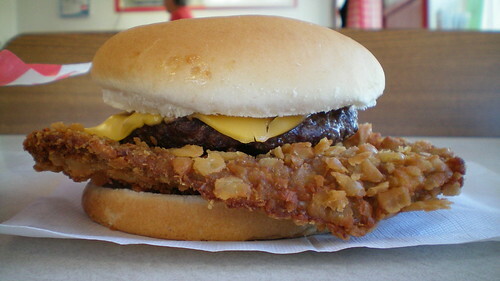 Tenderloins are served on an untoasted bun with basic fixings. Overall 8.0 out of ten. Price: $7.25 for the large. 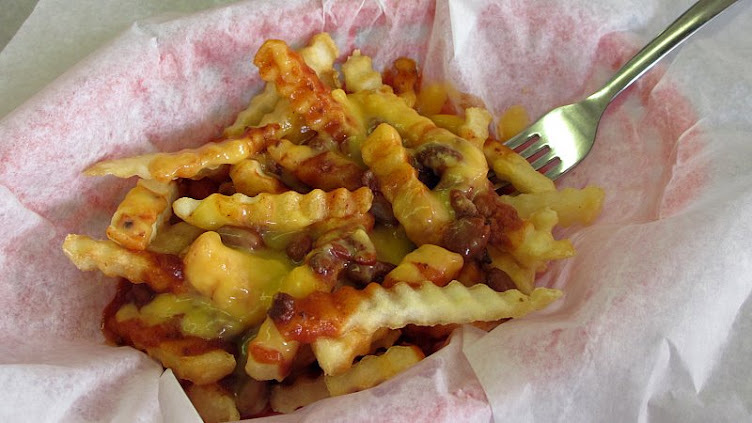 Also on the Menu: Diner grill classics like burgers, loosemeat burgers, fries, and shakes. In addition to the King Tenderloin, there are some other tenderloins with small additions like the Veggie Loin or Chili Cheese Loin. The simple flavors are found throughout the menu. The Taco Loin has the King Tenderloin topped with chili, cheese, the usual vegetables and a good amount of taco sauce. 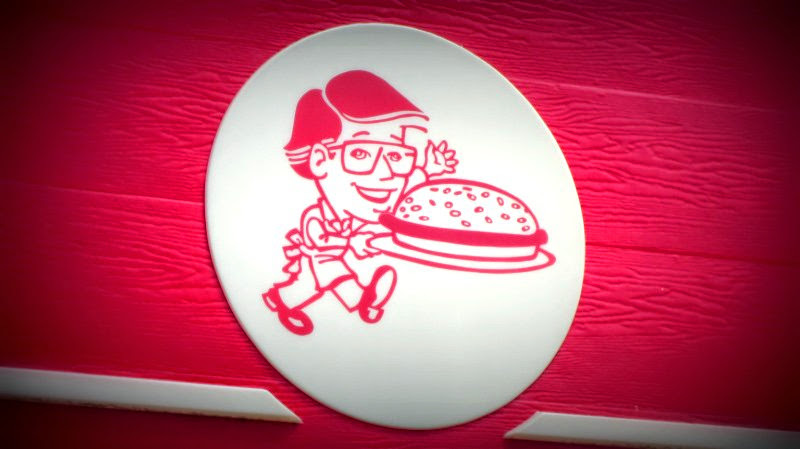 The only recent menu addition I can remember seems to the the Jack Burger. The description included onion rings and a special "Jack Sauce" that was lightly spicy. 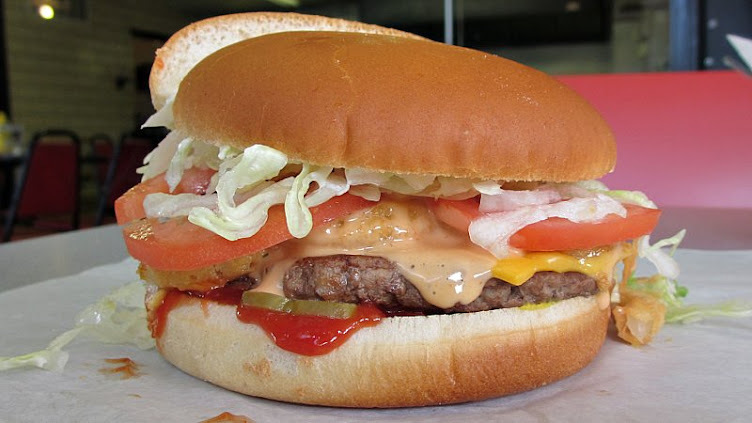 I have tried the burgers here once or twice and didn't think they were anything special. 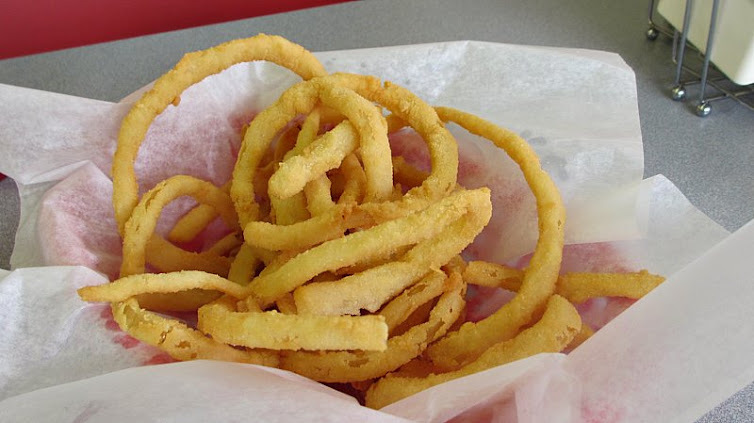 The only side dish with the word homemade in the description is the Homemade Onion Rings. Service: Its table or counter service, not very complicated. A good portion of the customers are visitors from out of town taking photos of the tenderloin, and the waitress offered to hold up the sandwich for me while I was in. Home of the REAL Whopper! claim is repeated often. Ambiance: The building has its own charm as a piece of old roadside architecture from decades past. The ceiling is tilted down towards the back like many of these older roadside places. The decorations inside and out make it clear that this is the temple of tenderloins, with the signature sandwich represented over and over again. I've never called the phone number. Final Thoughts: A huge amount of the exposure comes from the proximity to the airport where out of towners arrive. People stop in on their way out of town to pick these things up before leaving Iowa. Another element is that people from the South Side seem to think anything from the South Side of Des Moines is the greatest thing on earth. The 'Loin is big and crunchy, also a great value. The facade and interior of the place maintain a classic roadside look that shows the owners care about and take pride in what they are doing. I think they only sell frozen tenderloins for walk-in customers. But you can call and ask.